This particular type of ant, which lives in deserts, is like something out of The Matrix. When food is plentiful, honeypot colonies select certain workers—entomologists call them repletes—to serve as food receptacles for the group. The other workers tuck the repletes away in a safe spot, and then literally stuff them with food until the back sections of the repletes literally swell up like water balloons. Grape-sized repletes so fat they cannot walk are common. When food gets short, hungry workers just wander over to a replete, poke and prod it a bit, and wait for it to upchuck lunch. 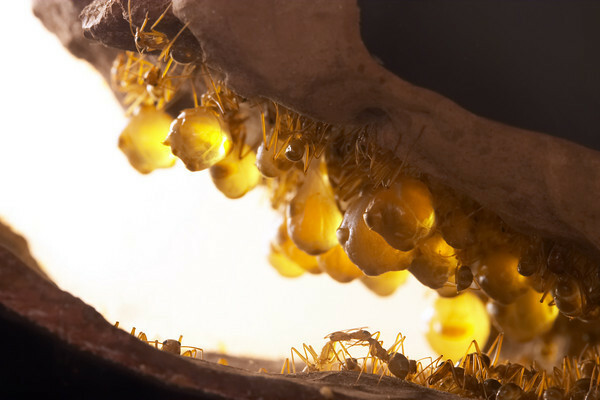 If that’s not bizarre enough, it turns out that rival honeypot ant colonies have a habit of raiding one another and plundering–then enslaving–repletes. Stranger yet, it’s not just ants that have a taste for repletes; they’re something of a local delicacy among certain tribes in Australia. Guenard, it so happened, was the perfect guy to ask about weird ants such as Myrmecocystus. He is in the midst of—get this—an effort to classify all the ant genera in world. That may not sound like much, but it’s an enormously ambitious task when you consider that biologists have yet to name something like half of the ant species scurrying around us. Nobody knows the total number of ant genera in the world, or species for that matter, Guenard tells me, since biologists have never managed to cobble together a systematic search at the scale required. That’s not for lack of effort. In the nineties, an ambitious effort to name every single species on Earth (not just ants but all species) in a mere 25 years—the equivalent of a Moon shot for taxonomists–flamed out when the tech bubble burst and the project lost its funding. Other efforts to classify smaller bits of ecological real estate have suffered similar fates. Still, there are biologists out there like Guenard doing their best to continue counting. Guenard, a graduate student at the University of North Carolina, participates in the Global Ant Diversity Project, an effort led by his adviser Rob Dunn and sponsored, in part, by NASA. (I first met Dunn at a NASA-sponsored Ecological Forecasting conference where he was explaining how he uses satellite data to predict global patterns of ant diversity. Check out this PowerPoint if you want to learn more about how that works). Guenard updates the growing ant database as new information turns up in the scientific literature, but he also keeps an astonishing website and blog that brims with eye-popping photography and commentary about ant species that I’m willing to bet you never knew existed. Take a look, for example, at these Pachycondyla chinensis doing battle with some hapless-looking termites. Or look at this pint-sized worker intimidating a hermit crab dozens of times its size. I certainly couldn’t get enough ants from the website, so I gave Guenard a few calls this week to pick his brains about ants and honeypot ants in particular. Here’s a clip from our conversation in which we discuss, among other things, the scientific value of ant licking, replete raiding, and how to tickle an ant to make it spit. Why NASA does not have a button I LOVE NASA in Facebook and Twitter? I do love Nasa because it is for me the most important scientific institution worldwide. Previous Previous post: What On Earth is That?